50% of girls in India are married before the age of 18. Only 15% of females are employed in the workforce due to lack of qualifications or proper training. Education is the key to independence and long term security. In partnership with Nawneet Ranjan of Dharavi Diary, HADAYA offers full university scholarships for girls that cover room and board, transportation costs, university fees and tutoring. The mission of Dharavi Diary is to empower the youth of India, especially girls and women, living on the fringes of urban and rural lower income communities through STEAM learning (Science, Technology, Engineering, Arts, Mathematics), storytelling and skill building to become problem solvers, innovators and leaders. Our scholarship program began in 2016 and with your help will continue to grow. We are thrilled to announce that in July 2018, Chai Pani Restaurant Group made a long-term commitment of financial support for Dipali and Anu (see below), taking over from HADAYA who have supported them for the last two years. In partnership with the non-profit Dharavi Diary, Chai Pani will offer full university scholarships for the girls that cover room and board, transportation costs, university fees, and tutoring. HADAYA has been connected to Chai Pani for many years, through give-back nights held at their restaurant in Asheville, NC, and other fundraising initiatives. Earlier this year, we approached them to take on this scholarship commitment to Dipali and Anu, as we refocus our organization, and we couldn’t be more excited for all of them. Anu is a brilliant fifteen year old girl from the Dharavi slum of Mumbai, India. A few years ago, she lost her father in a road accident and her mother has struggled to keep the family afloat ever since. They live in a tiny 10 by 10 room with no running water or kitchen and only intermittent electricity with their extended family. Anu loves to read stories, is gifted at science and technology and has been internationally recognized for her work developing apps designed to help her community. She has already had a huge positive impact. HADAYA is helping her go further by funding a full scholarship for University. She is the first person in her family to have this opportunity. Dipali is a talented fifteen year old girl, also from the Dharavi neighborhood of Mumbai, India. She is a gifted artist and loves nature and astronomy. 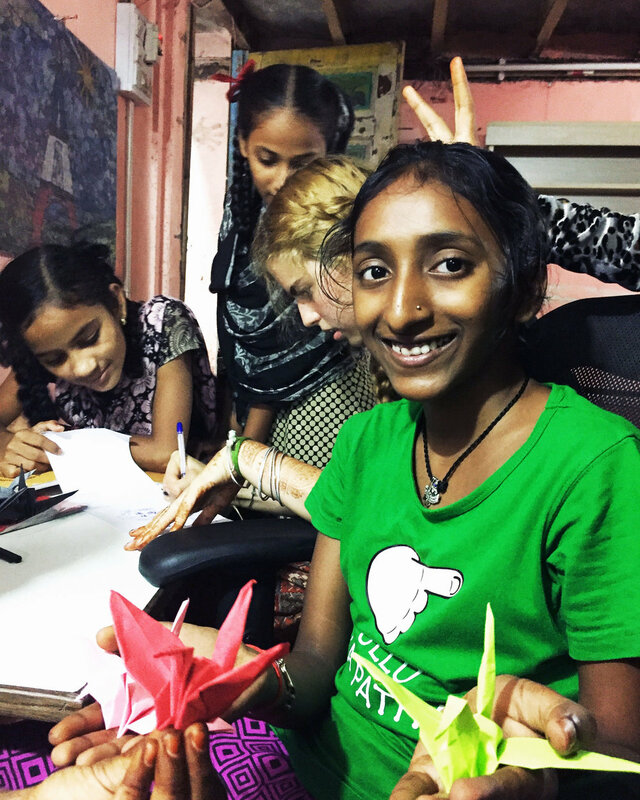 She can frequently be found in the Dharavi Community center helping other students with work and encouraging them to do their best. She spends much of her time there, in a large part, because of her difficult home life. HADAYA would like to offer her a scholarship to finish High School and University in a boarding environment where she will be safe and able to focus on her studies. Dipali has expressed interest in becoming a teacher and working with children in her community.